There have always been ethical issues with Psychology because Psychology involves studying the most intimate aspects of people's lives: what makes them what they are. Psychological research may do more than just observe participants: it may change them too and not always for the better. These concerns came to a head in the backlash after Stanley Milgram's study into obedience in the 1960s. 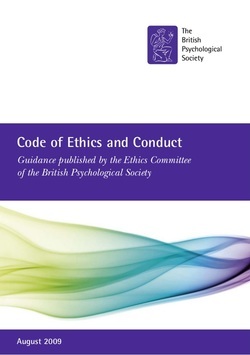 In response to studies like Milgram's, the American Psychological Association (APA) and the British Psychological Society (BPS) created codes of conduct for researchers. Researchers who go against these Codes will struggle to publish their work and may even lose their jobes. Candidates are expected to evaluate research ethically, weighing up whether research can be justified if it harms or manipulates participants and suggesting improvements to unethical research. Candidates are expected to conduct their own practicals ethically and these must comply with the BPS Code of Conduct too. Psychologists are dealing with human participants in their research and have the potential to distress or exploit them. Besides being wrong in itself, research that leaves angry and traumatised participants drags the whole discipline of Psychology into disrepute, making it harder for future researchers to recruit samples or attract funding. Moreover, because psychological research has applications for the real world, researchers must also consider how their research will be used once it is published and whether it gives encouragement to destructive behaviours or unacceptable views. These issues become even more urgent when the participants in psychological research are vulnerable or the conclusions touch on sensitive topics: children, the mentally ill, sexual behaviour and antisocial or criminal activities. The 4 principles are a helpful way of evaluating studies and your own practicals. However, you might prefer to pass over this section in favour of the more familiar guidelines in the next section. Privacy: This means people's right not to be in research and not to share data about themselves with others. You respect people by concealing their identity if they wish it and not making their behaviour or views public if they wish it to remain secret. It is disrespectful to put people on show and spread information about them without their agreement. Dignity: This is the idea that people have a right not to be "lumped together" as part of a group or treated according to stereotypes. You respect people by finding out about them as individuals and treating them as they wish to be treated. It is disrespectful to ignore people's wishes or concerns and treat them as anything less than an important individual. Respect is a principle, not an absolute rule. For example, there may be reasons why a researcher has to overrule a participant's right to privacy. For example, the research might show up a crime or a medical problem that must be acted on, so that police or doctors have to get involved. However, respect for dignity means that participants should be advised about the possibility of this before the research begins. Then there is research that involves tricking or trapping participants in some way, putting them in situations that are uncomfortable or not what they seem. A good example of this is Milgram (1963) who told participants they were taking part in a memory test but really their obedience to an authority figure was being observed. Research that disrespects people's autonomy in this way needs special justification. Respect for dignity means that participants should be debriefed so that they can give their consent to taking part after-the-event. Scientific integrity involves honesty and accuracy in how research is conducted and published. One aspect of this in transparency. Honest research does not deceive participants; everything is "above board". Dishonest research deceives the paricipants and increases distrust of Psychology as a subject. Another aspect is professionalism. Professional scientists maintain a detachment from participants and the topic being researched. This includes avoiding personal relatioships with participants or allowing your personal feelings to influence the research. Unprofessional research will not be objective, damages the reputation of Psychology and may damage the trust of participants. A third aspect is collegiality. Scientists are responsible for each other's conduct. Colleagues should monitor each other and report ethical violations they see going on. Scientific integrity is an ideal and not an absolute rule. 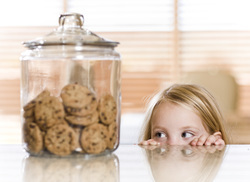 There may be reasons that justify deceiving participants. Events may occur during the course of studies that demand that the researchers drop their professional detachment; there may be some topics (studying deprivation or abuse, for example) where too much detachment on the part of researchers would be distressing for the participant too (you may feel this is the case with Watson & Rayner's treatment of Little Albert). Social responsibility is about making sure research leads to good outcomes for everybody involved. It involves recognising that the research may carry on having effects long after all the data has been gathered. Research should serve "the common good"; this means it should be beneficial for the people who took part in it and for the communities affected by it. Research should not stir up social unrest, fear, blame or antagonism. This is especially important for research into ingroups and outgroups, for example. Debriefing is an effective way of promoting social responsibility; the correct understanding of the research can be shared and the participants' concerns and grievances can be addressed. Professional competence is also important here. Researchers can have a lot of influence over participants, who may look to them for advice, diagnosis or reassurance. Researchers should only provide information or advice they are qualified to pass on. This is particularly important for researchers studying mental illness, especially if they are not qualified doctors or psychiatrists. Researchers are supposed to conduct a cost-benefit analysis when it comes to their research and only proceed if the benefits outweigh the harm caused. The risks of research need to be assessed. Risk assessment must take place before the research begins and include risks to the participants during the study and risks to participants and others after the data is published. 'Normalising' unhelpful behaviours: Participants could develop 'unhelpful' behaviours as a result of the study or else gain the impression in the study that these behaviours are socially acceptable. Think of Little Albert being conditioned to fear white furry animals or Bandura's child participants having aggressive behaviour modelled and reinforced. This sort of research should be avoided. Creating self-doubt: Participants may leave the study with their self-esteem dented or less faith in their abilities. Think of Milgram's teachers who were shown that they were willing to kill someone if ordered to; you may also consider Becker's Fijian schoolgirls who were asked questions about their body dissatisfaction or Brendgen's twins who were identified as mean or violent. Debriefing can sometimes reduce these risks. 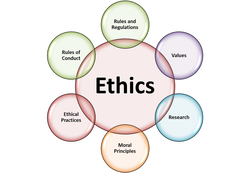 These are familiar ethical guidelines and you may prefer to focus on these rather than the 4 principles when you evaluate research. One of the ethical principles for researchers is that they should minimise harm and maximise benefits. This involves a risk assessment before research begins. This last passage is important because even if the actual participants are unharmed, the research may cause problems for groups once it is published. For example, some of Becker's Fijian schoolgirls criticised their families' values during the interviews, so the publication of the research might have led to family rifts. This is an even bigger problem if the research suggests there is a problem with a whole group of people (say, redheads or Belgians). Labelling: by the researcher or the participant, leading to ideas like "I am stupid" or "I am not normal"
Participants should be asked to agree to being in research and this should be informed consent: the participant should know everything that is going to happen during the study and why it is going to happen. Prior consent is consent obtained before the study starts. This is best with adults and necessary for any study ivolving risk. Presumptive consent is when other people say they would be happy to take part in the research, so it is assumed that the actual participants consent too. Presumptive consent may be acceptable with relatively harmless research like memory tests. It also occurs when parents give consent on behalf of an under-16 child. Participants should be able to withdraw their consent at any time; if they cannot leave the study when they want to or have their data removed from the results, then this is not valid consent. If the research lasts a long time (eg a longitudinal study or case study), consent may need to be renewed for it to remain valid consent. Lots of factors may make it difficult to obtain valid consent. Research involving mental health or prison raises the question of whether patients or convicts are competent to give their consent. One solution is tacit consent, which is when you assume a participant is consenting because they don't indicate clearly that they would rather withdraw. However, many people argue that tacit consent does not respect a person's autonomy or dignity. Studies like Milgram (1963) or Burger (2008) require naïve participants who are not informed as to what is going on. Full and immediate debriefing afterwards may enable participants to give valid consent in retrospect. Participants have a reasonable expectation that they will be anonymous when the data is published. Any information about themselves will not be passed on to anyone else: people own their own data and researchers cannot pass it on without their consent. If researchers intend to make the data available to other researchers (eg for peer review purposes) then participants must agree to this. 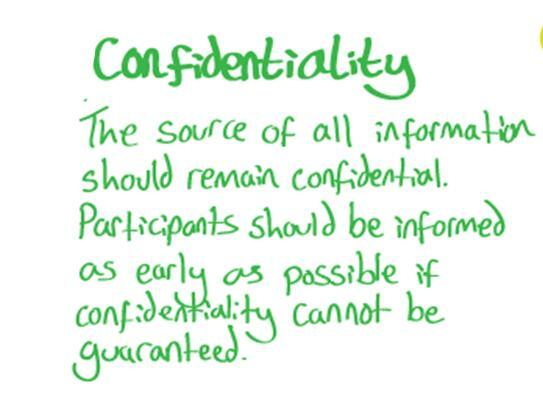 Confidentiality is not an absolute right: there are safeguarding issues when information about crimes or danger to vulnerable persons (eg children) must be passed on to the police. As part of giving valid consent, participants should be advised about who else will receive their data. This is part of respecting the participants' autonomy and dignity. In general, researchers must be competent to give advice to participants. The research situation means that any advice a researcher does give may have an undue influence on the participant, so the principle of social responsibility is very important here. Ideally, any questions should be referred to an expert authority (a doctor, psychiatrist, lawyer, teacher, etc) and the researcher should not attempt to offer advice they are not qualified to dispense. Sometime, research might reveal a condition the patient is unaware of (such as high stress levels, a mental health condition or a lifestyle problem). In a case like this, social responsibility means that the research should discuss the problem with the participant, especially if harm would be caused if the participant were kept in the dark. Researchers should avoid lying or misleading participants. 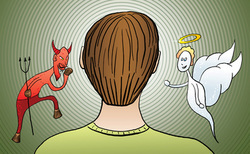 Sometimes this may be unavoidable, because psychologists often study characteristics that participants can alter at will (eg attitudes, beliefs, social behaviour) and if participants are aware of what is being studied there may be demand characteristics; if participants are conscious of being observed, there may be social desirability bias. Both of these are possibly confounding variables that lower the validity of research. This includes covert observations which invade people's privacy. It may even involve observations in public places if the participants had a reasonable expectation that they were unobserved (eg in a changing room, on a quiet beach). Deception disrespects the dignity of persons. As with valid consent, an immediate and full debriefing may make up for this, but if there is a risk that the participant, once debriefed, would respond with anger and anxiety, then the ethics of the study should be questioned. Participants are usually briefed at the start of the research; this is when valid consent is obtained retrospectively and confidentiality is explained. Debriefing should take place after the data has been collected. Participants must be informed about anything that was hidden from them during the study, including the aims of the study, the results and the use the data will be put to. This is an opportunity for participants to insist their data is withdrawn from the study. Debriefing is also an opportunity to reduce the risk of harm to participants. Sometimes debriefing cannot take place. This might be because the participants are unavailable (perhaps because they were unaware that they were participants in a covert observation) or else because the participants are not competent to be debriefed (eg young children, some mental health patients). For example, Schmolck et al. (2002) could not debrief H.M., who had no memory of doing the tests. This creates ethical problems if the research involved the violating of other principles (for example, H.M. could not give valid consent to the research either). One way to ensure a study is ethical is to carry out a risk assessment before it begins. During a risk assessment, you identify all the possible risks participants could face during and after the study. Mitigating risk involves setting up strategies to plan for risk and reduce it. Risk-mitigation isn't always possible. In deciding whether to go ahead, researchers need to weigh up the severity of the risk and the likelihood of the risk. Low-severity risks that are very likely may be acceptable if something is set up to mitigate them (eg you could mitigate the risk of distress by making sure you debrief). The same is true for high-severity risks that are very unlikely (eg you could mitigate the unlikely risk of fire by making sure the room you are in has a fire exit). Risk can never be entirely avoided and it's not always possible to mitigate risk either. The decision whether to go ahead with a study depends on whether you think the risk has been mitigated enough and this is a subjective interpretation. A good example is Burger (2008) who replicated the Milgram study. Burger mitigated the risk to participants by only taking the shocks up to 150V; he assumed that any participant who would deliver 165V would go all the way to 450V and stopped the study there and then. He also lowered the test-shock to 15V and carefully screened participants to remove anyone with emotional vulnerabilities. Nonetheless, Burger still put participants through the experience of electrocuting a man who seemed to have a heart condition and when they tried to withdraw they were met with scripted "prods". Burger felt he had mitigated the risk still further by making sure his debriefing followed immediately upon the end of the test. A different example would be Watson & Rayner (1920) who intended to mitigate the risk to Little Albert by conditioning him back to showing no fear of the white rat. However, Albert and his mother moved away before they could do this so Albert was never properly debriefed. If he did keep the fear of white rats (and other things) for the rest of his short life, he was certainly harmed by this research because unhealthy behaviour had been 'normalised'. In some research it is possible to get prior informed consent from competent participants, but not always. Sometimes it is important that the participants be naïve in order for them to behave naturally. Sometimes the study is a natural experiment involving participants who are not competent to give valid consent: children under-16, the mentally ill or people with learning disabilities, drug problems or in prison. With children, researchers may get presumptive consent from parents and/or teachers. ﻿Sherif et al. (1954)﻿ obtained consent from the boys' parents, although the parents would not have been informed about everything going on at the Robbers Cave Camp. Bandura et al. (1961) obtained consent from the children's nursery teachers, who were present in the observation room during the study. Brendgen et al. (2005) obtained consent from parents and teachers. Schmolck et al. (2002) face the other problem, because H.M. and the other brain-damaged patients were not medically competent to give consent. Schmolck obtained presumptive consent from the patients' doctors. However, there is a big debate about whether H.M.'s doctors really had his wellbeing at heart; H.M. was used as a psychological guinea-pig for his entire adult life. Much of this was tacit consent - because H.M. didn't say "No" it was assumed he was saying "Yes" - but tacit consent is incompatible with the principle of respecting autonomy and dignity. Participants have a right to be anonymous and to have some say about what is done with their data. Two good examples of anonymity are H.M. and Albert B.. H.M. was known by initials in all of the studies in which he took part. Only upon his death in 2008 was his true identity - Henry Molaison - revealed. Albert B. was a false name used by Watson & Rayner. In 2009, Hall Beck researched Albert's identity and found that he was really Douglas Meritte, who had died at the age of 6 in 1925. Revealing Albert's real identity does not breach confidentiality since it was done with the consent and help of Albert's only living relative, his nephew Gary Irons. Safeguarding issues might have been present in Becker et al. (2002) who studied eating disorders in Fijian schoolgirls. None of the girls were revealed to have an eating disorder, but if they had, it would have been necessary for Becker to break confidentiality and inform their family or doctor. This is a much more important issue in Unit 2 when you look at criminological and clinical psychology. Few of the Unit 1 studies involve researchers counselling participants. It is very important for the scientific integrity of research. This guideline was important for Anne Becker's research into Fijian schoolgirls. The semi-structured interviews explored the girls' feelings about diet, body-image and popularity and the girls may have asked for advice on eating and personal aspirations, however it was important that the researchers did not try to tell them what they should eat, how they should look or what their goals should be. Deception is treated separately from valid consent, because even if participants consent to be in a study, then can still be misled about what is happening once the study starts. The classic example of deception is Milgram's study into obedience. The participants were deceived into thinking Mr Wallace was another participant and that the lottery that made him the learner and them the teacher was truly random; they were deceived into thinking that the shock generator created real shocks and that the screams they heard were a real person in pain. These deceptions are also present in Burger's replication of Milgram. Milgram and Burger both mitigated this deception by debriefing participants afterwards, making sure all deceptions were explained and justified and checking that participants were still happy to have their data included in the research. There is also an issue of deception in ﻿covert observations﻿, especially if participants have reason to believe they are unobserved. Examples might be the use of one-way mirrors in studies like Milgram (1963) or Bandura et al. (1961). There is a similar deception in questionnaires or interviews that use "distractor questions" that conceal the significance of a "critical question" that the researcher is really interested in. Debriefing is not a "magic bullet" that imediately makes an unethical study ethical. However, debriefing can mitigate the risk in studies that do not obtain valid consent, that deceive or that expose participants to harm. One of the first psychological studies to use debriefing (perhaps the very first) was Milgram (1961). Milgram's thorough debriefing was the central argument he used to defend his research when he was investigated by the American Psychological Association and it won the argument for him. In his replication of Milgram, Burger (2008) is careful to debrief immediately after the end of the test. Debriefing is quite easy to do in lab experiments, where the participants are all gathered together in one place. It is harder to do in field experiments or naturalistic observations, because by the time the study is over, the participants may have moved on. Research that takes place in a public area is not usually considered to need debriefing, because participants knew they were being observed by others anyway. However, this won't apply if the researchers created an unusual situation (such as Sherif's competitions at Robbers Cave) or the participants had reason to believe they were unobserved. 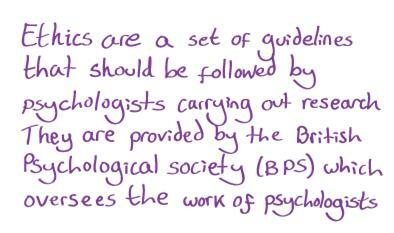 The British Psychological Society (BPS) lays out 4 principles for ethical research. These are respect, social responsibility, scientific integrity and minimising harm. Minimising harm involves considering how to reduce physical or psychological harm, either by avoiding it or by mitigating the harm produced (eg by debriefing participants later). One way of minimising harm is to carry out a risk assessment. This involves identifying how participants might be harmed and what could be done to mitigate it. High probable, severe harm must be avoided but less probable or less severe harm might be mitigated with good planning. 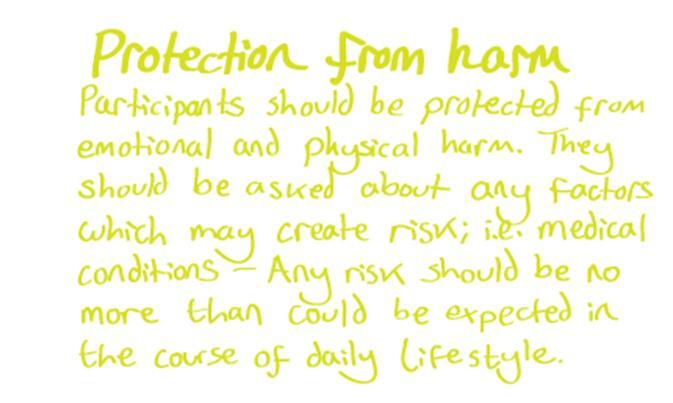 One guideline that mitigates harm is to obtain valid consent from participants. Ideally this should be prior consent that is fully informed. If that's not possible, presumptive consent could be obtained from someone else on the participant's behalf. It's never possible to avoid harm altogether, especially if psychologists want to carry out research with external validity into dangerous or stressful events in the real world. A good example is MIlgram's study into obedience which tries to put participants in the same situation as people who went along with the Nazis in carrying out the Holocaust. If participants know the true purpose of research, they can change their behaviour to be "good participants"; this is known as demand characteristics. Milgram's solution was to debrief participants afterwards and mitigate the harm by getting them to consent to it retrospectively. Many said they were glad to have taken part. Debriefing participants is not a magic bullet that solves all ethical problems. 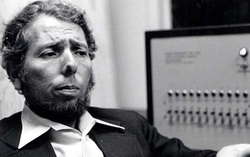 Critics say that Milgram did not mitigate all harm by debriefing participants, however Milgram obtained psychiatric reports that suggested the participants had experienced no long-term ill effects. Notice that for a 8-mark answer you don’t have to include everything in ethical issues. I haven’t mentioned the importance of competence or withdrawal. I haven’t described Milgram's prods or how Burger iproved on his procedure ethically. But I have tried to make the two halves – Description and Evaluation – evenly balanced.